Visual Calculus is an easy-to-use calculus grapher for Graphing limit, derivative function, integral, 3D vector, series, ode etc. 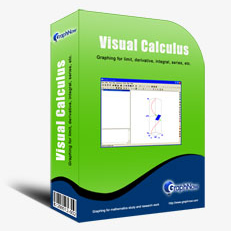 Visual Calculus can create 2D, 2.5D and 3D function graphs, animations and table graphs. 2D and 2.5D function graphs can be plotted in Cartesian and polar coordinate systems,and 3D function graphs can be plotted in Cartesian,cylindrical and spherical coordinate systems. ...... tangent and normal; curvature circle; intersection; line plot; scatter plot; stem plot; step plot; curve smoothing. * 3D Features: cartesian, cylindrical, and spherical coordinate systems; 3D curve and surface; animation; 3D surface based on table data; surface by rotation; 3D vector; tangent and normal of 3D curve and surface; material and light. An interesting grapher to create a graph of fractal. Qweas is providing links to Visual Calculus 3.7.3 as a courtesy, and makes no representations regarding Visual Calculus or any other applications or any information related thereto. Any questions, complaints or claims regarding this application Visual Calculus 3.7.3 must be directed to the appropriate software vendor. You may click the publisher link of Visual Calculus on the top of this page to get more details about the vendor.